Regular service of the brake system is essential, as it saves you from accidents. For example there is moisture coverings in your brake fluid there are high possibility that it could lead to a sluggish brake system or corrosion of components and even brake failures which can be fatal. Petra cares about your safety and recommends a regular maintenance of your brake system fluid. 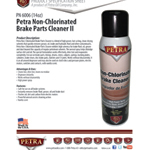 Petra Brake cleaner helps in reduction of the break noise and cleanses the dust from brake. Products such as brake cleaner, brake fluid will help to eradicate the moisture, compression also the air from the Brake system. The regular service of brake system with Petra brake cleaner will help in extending the life size of the Brake systems and have a smooth work of brake application. The service utilised by fuel system product, fuel injector and fuel system cleaner helps to eliminate rough indolent, decreases the problems of hesitation in the vehicles fuel parts such as valve, injectors, combustion chambers etc.